Bacon Jelly Beans: Candy flavored like the greatest food in the universe. If you’re a true bacon lover, your passion doesn’t stop at breakfast. You’ve probably already snuck the smoked meat into sandwiches, mixed it in with your vegetables, and even wrapped it around other meats. Now you can conquer the final frontier where salted meat dare not go: dessert! Bacon Jelly Beans are little candies filled with the smoky, meaty flavor of bacon. The savory sweets will confuse and delight your tongue with an intriguing mix that bacon lovers have to experience. And since they’re packaged in a very giftable tin, it’s easy to share that experience with your fellow bacon enthusiasts. 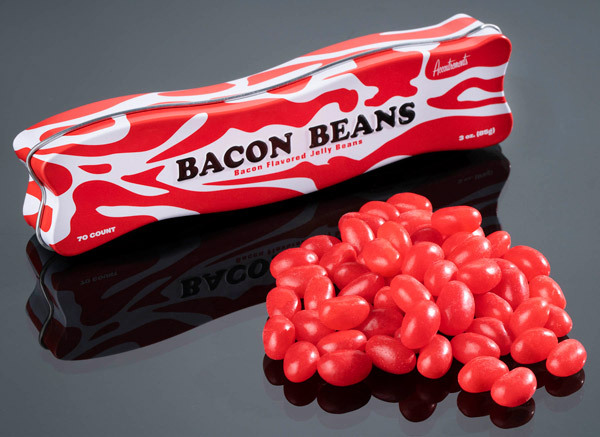 Whether you want to have bacon for dessert or candy for breakfast, you’re covered with Bacon Jelly Beans. This candy form of cured meat has a distinct flavor that combines the sweet and savory in an unexpectedly chewy way. Each pack contains 70 Bacon Jelly Beans so you’ll have enough to satisfy your sweet tooth and your bacon addiction. Bacon Jelly Beans are packaged in a giftable tin shaped like a strip of pork fat so your recipient knows exactly what they’re getting their tongue into. And most importantly, these candies are part of a complete jelly bean breakfast. 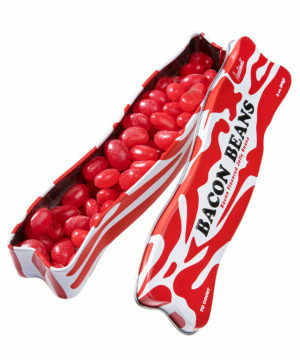 70 bacon candies per tin amounts to a hill of beans. Question: Do these have meat in them? 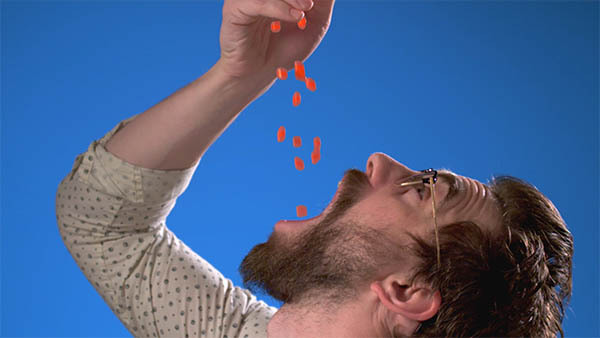 Answer: Bacon Jelly Beans are meatless. Question: Hold on—they make non-fruity jelly beans now? Answer: Oh yes. And they’re magnificent.